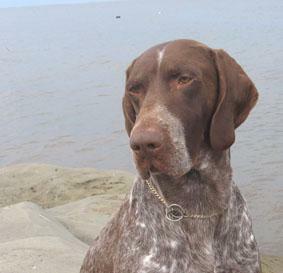 Cedar was a German Shorthaired Pointer co-owned by myself, Fred & Marie Cook. The first time that I saw him, I was staying with Fred and Marie and was settling in for the night. I had my contacts out and this blur of grey sped past me and out the door. I immediately told them that I wanted him. I had no idea at that point of his personality, his conformation, or the impact that he would have on my life and those around me. His mother Brooke, another of their dogs; was a dog that I showed multiple times in Junior Handling, and I had always wanted her in male format. I was looking for a specials dog, and a loyal companion. I got so much more than that. A few weeks later when we went back to really look at him, I took him out on a show lead for the very first time. He gaited without missing a beat, he stacked like a million bucks; he had found his calling. He was a true show dog and he instantly had my heart. He quickly earned his championship with very limited showing, and earned the hearts of all that met him. At just over a year we hit the specials ring with force winning many group placements, multiple group firsts (many under breeder judges) and even a Best in Show under Maurice Tougas. He was turning heads with his quality, his showmanship and his zest for life. He could frequently be found playing soccer with spectators with empty pop bottles. We moved the games farther from ringside when this got us in trouble when he was 6 months old; during Best in Show isn't the greatest time to swat a bottle into the ring. I thank Fred and Marie everyday for the blessing of having had Cedar in my life. And to Cedar, for the blink of an eye that he was with me and enriched my life. He was there for me during some extremely hard times, and most days he was my only reason to get out of bed. I don't know what I would have done without him, I miss him everyday and wish that more people could have experienced the amazing soul that he was. Usually when a friend is lost, we in the dog world write a goodbye. Many times over the past years, I have attempted to start this and everytime I have failed miserably. Words cannot describe how he affected me or how I cared for him, nor can music, dance or art. Those that he has touched are the only ones that can understand when I say this as he was so truely special. He is missed everyday by many people, and there isn't a moment that I don't think of him or how he would have enjoyed the trip to the beach, sharing my icecream, my empty pop bottle, or curling up with me at night. I will never be the same, this is my curse and my blessing. He has made me a better person. I look forward to the day when I join him, over the Rainbow Bridge.